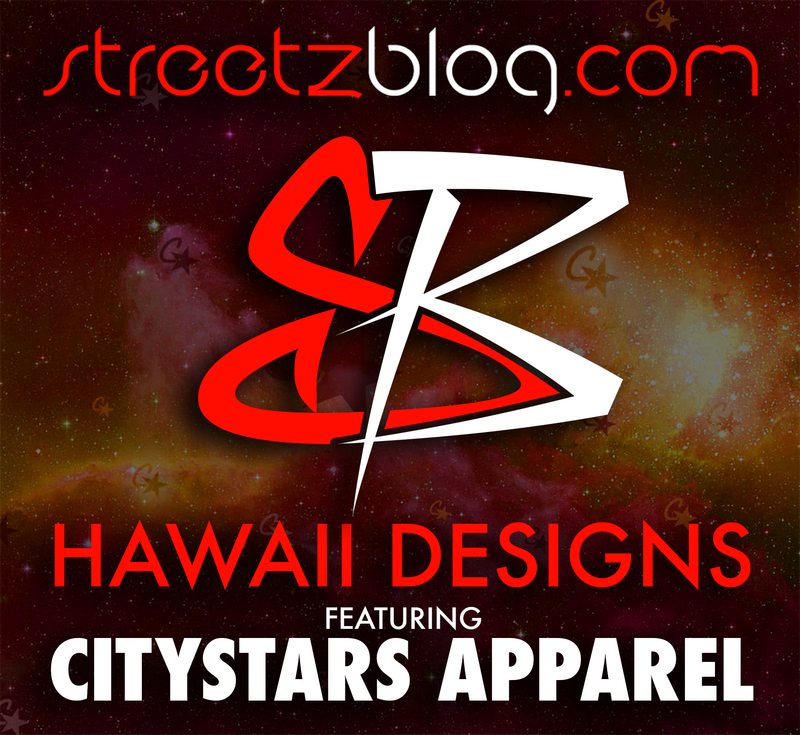 The Streetzblog Hawaii Designs Series chats with CityStars Apparel…Where Everyone Deserves to be a Star! For this edition of Hawaii Designs, We sat down with CityStars Apparel’s, Romeo Valentine after this year’s Honolulu Festival Gala. Where we feasted on Delicious Delicacies from Ruth Chris Steak House, Morimoto Waikiki, Roy’s Hawaii Kai and Honolulu Coffee Company. Prior to the Jump event with DJ HED at Vice Nightclub. 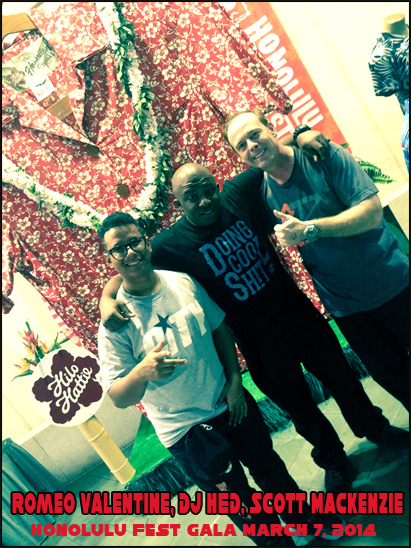 The picture below is from the Honolulu Festival’s Friendship Gala in front of one of the World’s largest Aloha Shirts. 1. So, you recently celebrated your one year Anniversary, Has everything gone as you expected? In our first year we’ve experienced a lot of turbulence but through it all it helps us grow. Without the turbulence we wouldn’t be able to overcome our fear of flying and reaching for the stars. 2. And you brought in big time DJ Carisma? How did you hook that up? Have you brought anyone else to Hawaii? DJ Carisma is a friend of mine that I’ve met a few times she came out here but really linked up the time she came out here with Honey Cocaine for the Chris Brown concert. DJ Carisma fits perfect in our genre and what we are about, so it was great to have such a humble but successful person to bring in for our one-year anniversary along with Abby De La Rosa. 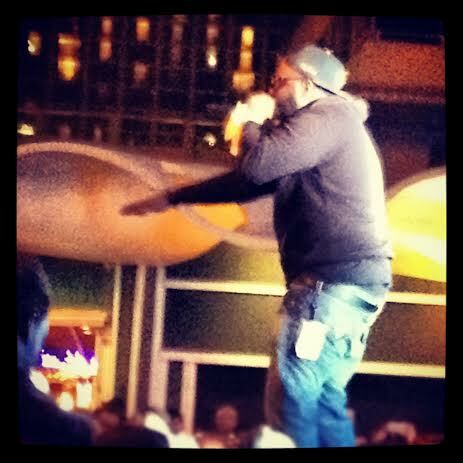 We have brought in other acts before such as YG, New Boyz, Tyga, DMX, DJ Drama, Glasses Malone, DJ Hed, and more. 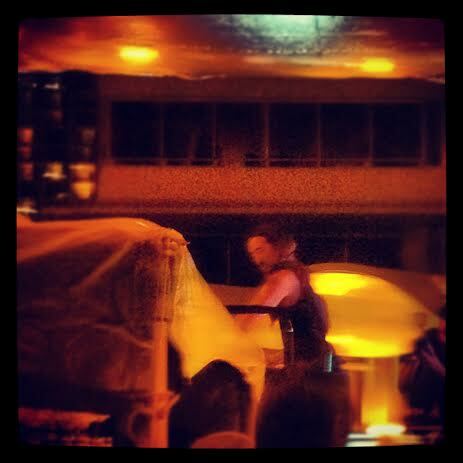 We also plan to bring a lot more fun shows and events in the future featuring some national acts. 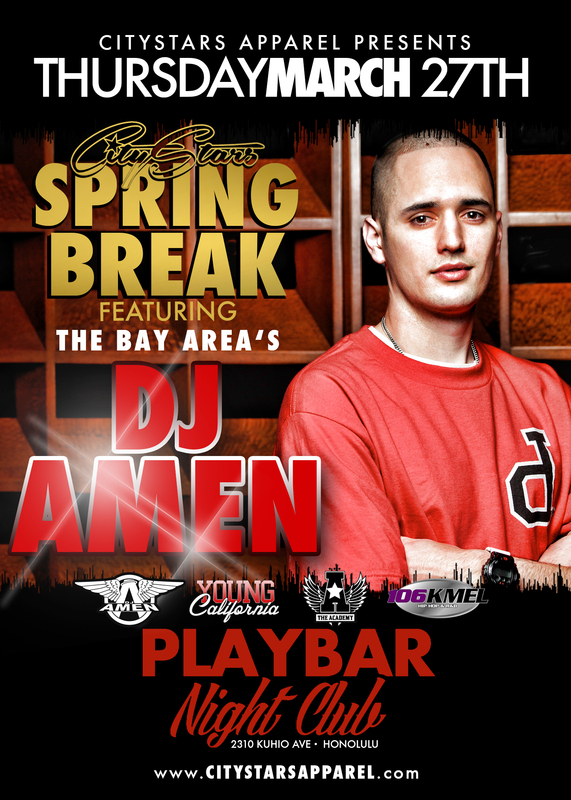 And for Spring Break 2014 we brought in San Fran’s DJ Amen. 3. Are you a clothing company or like an all around lifestyle brand? Both. We live this lifestyle in the night life to the music to the dancing we like to keep it fresh. We want everyone to feel like a star when they rock the gear. 4. What are your goals in 2-3 years with CSA? Our plan is to take this dream we have and make it reality. When we do that we want to take everyone who supported and was their to contribute and help us when we struggled with us to the top. CSA wouldn’t be without the hard work and dedication everyone puts in. 5. The name of your brand is so perfect, it seems to fit so many different things that you do, from the designs to the shows. 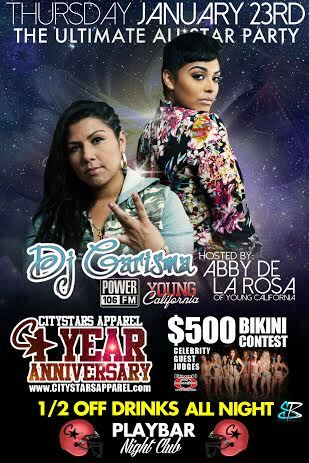 How did you come up with CityStars Apparel? And what does it mean to you? The name didn’t come over night but when things come to you they just happen. It fit perfectly with my lifestyle. I was in the clubs every night, promoting, partying, rockin’ the mic and in the day I was at the radio station (Power 104.3). It all sounds like fun which it is, but hard work so the city represents the hard work and the stars represents you being better than just normal. You are a CITY STAR. 6. Who creates and designs your shirts and hats? Our main designers are Ryan “Dj First Class” Garo and I (Romeo Valentine). Along with Gary Dymally and Monica putting ideas together to help contribute and Ka’aina Nahale working hard on hand drawings that he comes up with or ideas we have that he can bring to life. 7. What type of software do you use to design everything? Everything we do is in Photoshop. As well as drawings on a piece of paper which we transfer and redraw in Photoshop. 8. What has been your biggest seller? And why do you think it did so well? Our biggest seller to date has been the Louie Stars design we released in early 2013. I believe it was the best seller because the design pattern was catchy and our customers at the time liked the how long the design was on the shirt and of course our floral snapbacks are in high demand. 9. You recently made football shirts? How did you pick the teams you chose? Which was the biggest seller/hottest colorway? We chose the 5 teams which had the best following in the state we are in which is Hawaii. Pittsburgh, San Francisco, Oakland, Dallas and New England. The best had to have been San Francisco and Oakland. 10. And where were the Chicago Shirts? We actually made a Chicago Design but it didn’t make the cut along with the Packers. 11. How did you come up with the idea for the football shirts? We grew up watching football. It was cool to represent your team in the club without having to worry about dress codes of jerseys. 12. I really like the purple and orange Galaxy lanyards? They are very intricate? How many hours did it take to design and then produce them? The lanyards where quick it was the design of the galaxy pattern that took a while. If you look closely there are small City Stars logo’s inside of the galaxy. We also have Hats with the same pattern. 14. How do you get the word out? I know I see you on Instagram a lot? Which social mediums do you use? It’s all word of mouth and Social Media. We also do photo shoots and update our look books. Right now we are on Twitter, Facebook, Tumblr and Instagram. 15. Do you think you could have had the same success with your brand 2 years ago before the social Media explosion? That’s a tough question. I do believe us coming out when we did was perfect timing to really make a statement and get to the next level. 16. Where do you see Social Media going in the future? Are you on any newer mediums? Any cutting edge social media sites you would recommend to an up and coming designer? Social media is a rollercoaster, by that I mean which social network will be on top and with that being said when the next social network comes out we are going to have to jump all over that social network. We are willing to take that challenge to go to the top and keep rising. Right now though Instagram is where it’s at. 17. For the just getting going designers our there, what is the perfect size for an instagram photo? How bout the length of a FB or instagram video? For designers starting out using social media, it is important for the dimensions to be just right. When using Instagram the photo has to be a square. Making your photo 5 inches by 5 inches will show you exactly what viewers will see. Facebook videos can be longer than Instagram videos. When creating a video it depends on what type of message you are trying to get across, thus affecting the length. A 15 sec Instagram video and a 2 minute Facebook video are good lengths to keep viewers attention. We like to use Instagram to reach our fellow CityStars because of how quick and easy it is to use. 18. I know your clothing line is available on-line, do yo have your clothes in any stores in Hawaii? 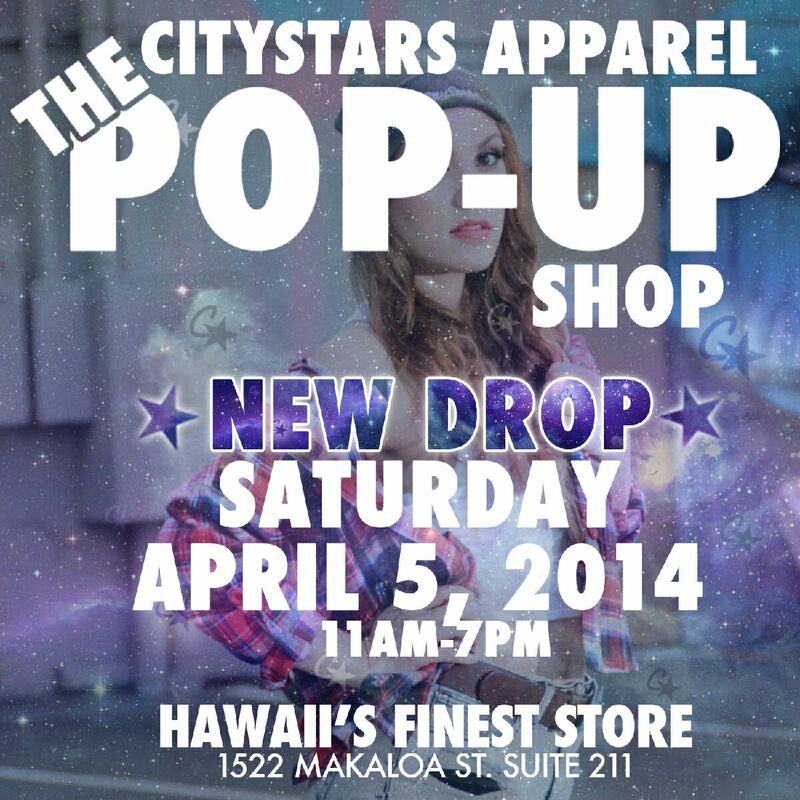 CityStarsApparel.com and Hatsby in Pearlridge mall which we will expand soon once we are able to justify ourselves as a brand. 19. Any plans on having a brick and mortar store? Why do you think its important to have a brick and mortar store in the digital age? Of course we would love to get a flagship store but at the moment that isn’t in our lane and we understand that which will make us work harder to a goal. 20. Do you personally shop more on-line or in person? On-line is easier plus you can see the deals. 21. Ok, so we made it to question 21, now tell us about your latest release, the galaxy snapbacks, Where are they available? Are they a limited release? 22. And after the Galaxy snapbacks without telling too much, what are your plans for the Spring/Summer line? And maybe you could let us know a little teaser about what to expect in the Fall 2014 or the Winter 2015 line? Let’s just say his name is COMET. 23. Anything else you’d like to comment on? We greatly appreciate everyone who supports us and is a part of our vision to take things to the next level so we can get to a point to put on shows for everyone without being over charged. We aren’t about ourselves we are about the people. We all work Hard. Everyone deserves to be a star. We also want to thank our good friends at Hawaii’s Finest for helping us out with so much. Plan Your Week Work your Plan: There are so many places to go, be, eat, drink and schmooze during Pro Bowl Week in Hawaii, you need to have a plan. Between NFL sanctioned events and Club events, I’ve counted 15 places within 7 days of I would like to go to. That’s pretty hard to do, so I’d recommend either making a paper list or using the notes area on your mobile to make a list of the places you want to be. Make them in order of most favorite to your maybe’s and take it from there. From Experiene, “I’ve been to so many events during Pro Bowl Week that I’ve actually needed to nap during the actual game, which is just plain lame”. Oh, And if you can, take the Monday after Pro Bowl off from work-you will need the rest. Wear comfortable Shoes: This is probably worse for me than you. But I tend to Rock my favorite kicks of the year during this special week. A different pair each day of the week. By the night of the Block Party (Saturday Night before Sunday’s Game) My feet are aching, a little bloody and slightly purple. Pick 2 days to wear your best kicks, save your rarest find of the year for Game-DAy, the rest of the week wear whatever doesn’t hurt. Over Christmas vacation, I picked up a pair of black Doc Martins with FLAT rubber soles and for some reason, these don’t hurt my feet and they practically go with everything. *Make sure you get the flat soles, I’ve had 3 other pairs of Docs throughout the years that looked great, but hurt my feet the next day so bad I could barely walk. Show Up Early: Wherever you choose to be during PBW, go early. It’s the best time to catch a player, get a good parking spot, better seat, or even no line at the Club. If you’re going to the Official NFL Block Party, I recommend either getting to this early or getting a hotel in Waikiki. Earlier in the night, it’s really nice to see the sunset, watch the Spectacular NFL Displays decorated throughout the street and really just enjoy a leisurely stroll through all of the magic of the evening. Later in the night, it can take over half an hour to get from one end to the other because of the huge crowd. This is also a place to make a plan, check ahead on which stage the bands and DJ’s you like will be playing and be at that stage for their performance. It can get pretty confusing as the night gets late on where everyone is playing. 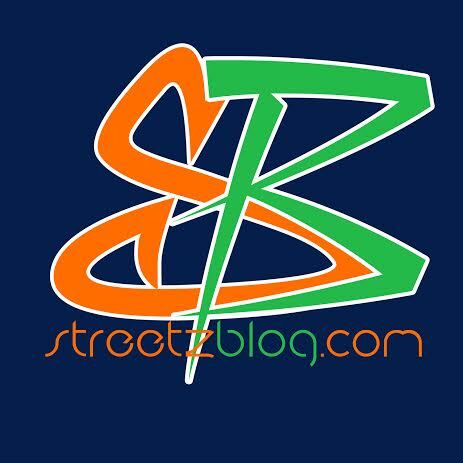 Early next week, I’ll add the schedule and full information on the entertainment at this years Block Party. (See bottom of Blog posting Tuesday). You’ll also want to show up early at this years game, you’ll want to go to the Official or non Official tail-gate party, get some parking, maybe relax or take a nap. Then head into the game and listen to the DJ’s Rockin’ it at each of the 4 main gates. You’ll want to get early so yo dont miss the pre game activities. The Pre Game festivities are quite nice especially when they fly the miliatry aircraft over head, Fire up the Fireworks and don’t miss this year’s half time entertainment with Fall Out Boy singing “Light it Up”. Wear Sunscreen: Even though you may not be at the beach, the sun is just as HOT and will burn you even on cloudy days. It’s no fun to be burnt on game day. Spotting Players: I know this may sound funny, but the easiest place to spot players is on their rented mopeds on Kuhio Ave. Other easy places to spot them are at the Nightclubs or if you really want to see someone, Splurge on a room at the Marriott or the Aulani out in Ko Olina/Ihilani. But try to be really nice. The reason they don’t stay in Waikiki anymore is too many people followed them around with big books of pictures and photos to get autographs. Oh, and check back here or the newspapers, on-line because every once in a while they do some signings at a Hotel, a Gas Station or some other sponsor location, you just need to be on the look-out fo these announcements. Other than that the next best place to see a player up close is at one of their open practice sessions or at Ohana Day Saturday Morning at Aloha Stadium (8:30 a.m – 11:30 a.m) You should also be able to see Fall Out Boy sing a song or two at Ohana Day. typically the main act at the Pro Bowl performs a song at Ohana Day. Get your souvenirs Early: Hey you know as I do it’s an island and on an island there’s only so much inventory here, then it’s gone. They used to have the best selection at the Hilton Hawaiian Village early on in the week. This year the official hotel has changed to the Sheraton, so I will check but would suspect that the Sheraton will have some nice Pop-Up stores early in the week. Other than that early evening during the block party is a great place to pick up gear, or Ohana Day still has lots of if not most of the most sought after goods. If you wait until game day, buy your stuff before the game or in the first quarter, by the 4th quarter, there’s barely anything left. Buy Early! *In past years, there can tend to be a sale at one of the hotels in Waikiki where things are discounted, but sizes and the best selections are hard to find, I wouldn’t wait for this possible sale. Buy Early.